See our Custom Built-In section for full Custom Libraries, Entertainment Centers, and Fireplace Surrounds! This solid mahogany double door Chippendale curio (upper left) is 24" by 40" and can be made in any wood and in any size per client specifications. Featuring a custom bonnet with center finial, the moldings make this simple box form into furniture on the wall. Shelving is glass. 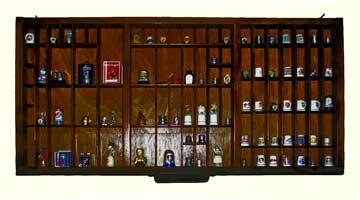 Lower left is a solid mahogany display unit in a simple mission form. The unit is designed with three glass sides and heavy duty mounting braces to support, protect, and display an 18th Century Family Heirloom bible. 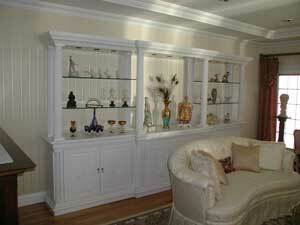 Curio and display units can be configured with or without shelves, and the option of glass shelving. 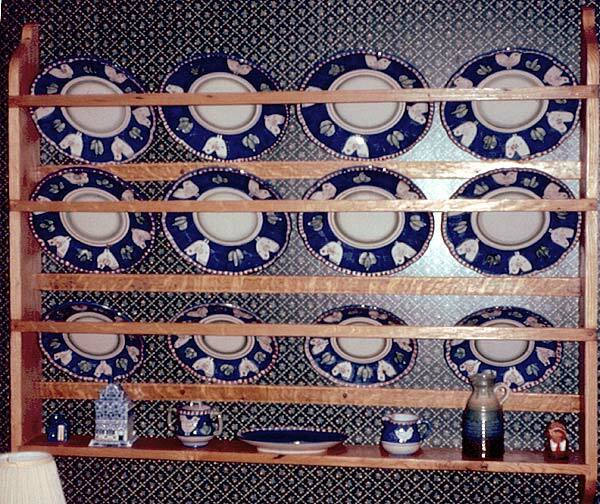 Right is a simple plate rack, a fine example of a custom piece designed to accommodate and display our client's plate collection. 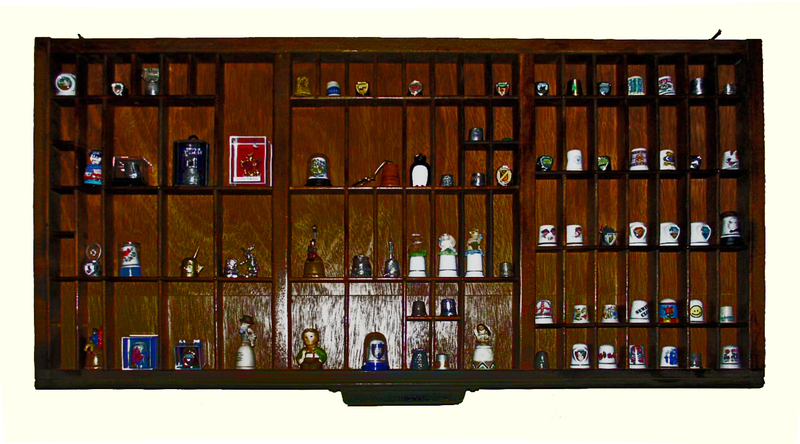 Plate racks can be designed to suite any decor and accommodate plates, cups, glasses, bottles, or any display item. Almost any cubbies oriented drawer, from a printers cabinet, a tool chest, or dozens of wooden trays designed to separate small parts can be converted into displays. Shown above is a toolbox tray, and below an example of a printers drawer. Cleaned and refinished, found at flea markets and various antique stores as singles or within furniture the display possibilities are limited only by your imagination. 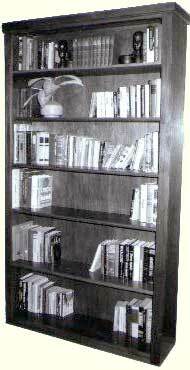 Stand-Alone bookcases can be made in any size from a full size 4' x 8' to smaller units to fit under window sills or fill an empty two foot section of wall. The unit shown is a full size piece in solid mahogany. 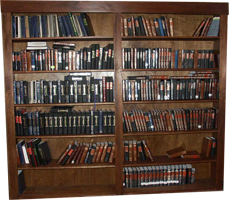 Units can be built in solid wood or a combination of solid and plywood. 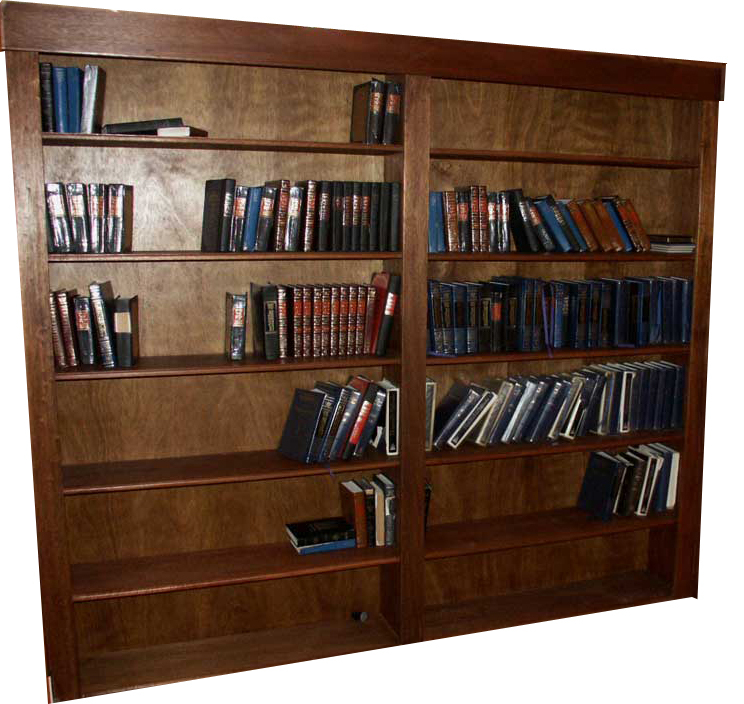 This four foot high mahogany bookcase utilizes previously wasted space under an opening to our client's kitchen. 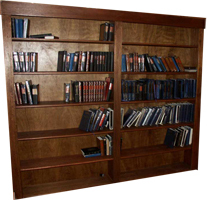 When we design bookcase and library units, we are not limited to a vertical design plane. No press board! These are real solid wood shelves. 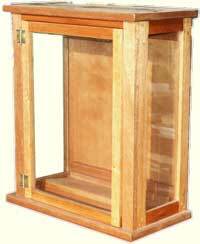 This poplar open back unit is simplistic and functional. Open back units allow storage with a less imposing presence than a case with a back panel. 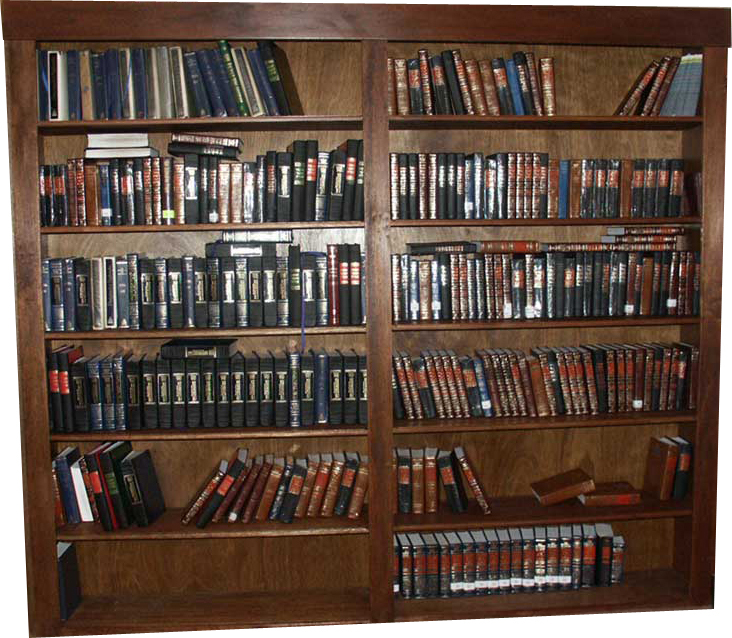 Commonly used in small rooms, these units maintain an open feel, while allowing for storage or display space. 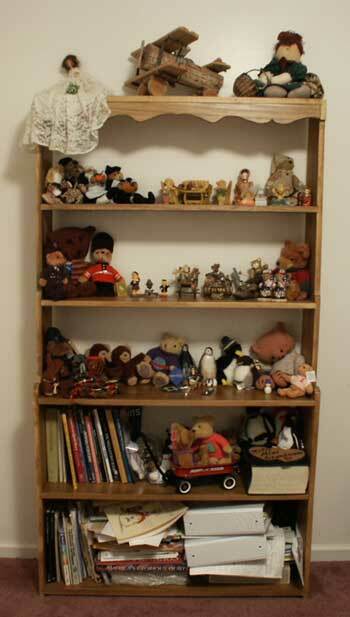 This unit is overstuffed with bears and dolls, a perfect concept for a girl's bedroom or switch to race cars and planes and it fits to a boys daydreams. This unit was a collaboration project, starting out with an Artisans consultation with our client that designed almost ever painstaking detail of this piece. There are many small, hidden, details that make this unit special. The unit features custom tapered fluted columns hand turned, then individually fluted. The corners of the base are each fitted with a full 1/4 round column, inset to allow a transition without a harsh ninety degree edge. The piece has precision fit inset doors MDF core doors with adjustable hinges. CNC carvings adorn each door, simplistic elegance was the theme to this feature. Glass shelving is individually hand fit, requiring a unique piece for each level. Fitting the shelving required custom machined mounting braces. The piece includes specialized lighting, positioned to reflect the client's collection through the glass shelving. The unit is also a modular design for transport purposes, assembly, and precision fit. 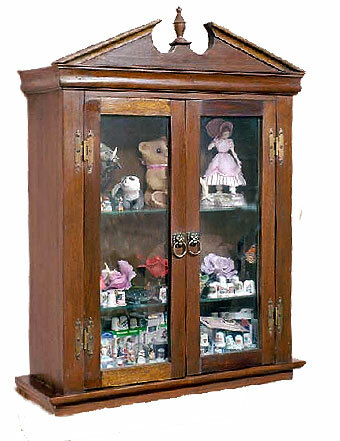 It consists of a base plate, three cabinets, a cabinet cap, and a bonnet. In addition each column is individually fitted and bolted in place. The custom paint job is that of an antique car, a high gloss white enamel sanded and rubbed past 2000 grit, then buffed top to bottom. The precision required this project to be cut on a CNC system. We transferred the lead role on this project to Jim Zaccaro of Custom Creations. We maintain working relationships (affiliates) with shops like Custom Creations to offer an expanded line of services, beyond our in-house capacity and equipment limitations. Artisans will be happy to assist with design services, and provide project management services for projects requiring interaction of multiple craftsmen to provide a unique, functional, and artistic piece for your home. Feel free to contact us, or Custom Creations directly, for this unit.